I’m not even sure how to write this post. I don’t know where to begin or where to end, so forgive me if I ramble. Or cry. Or blubber all over the page. This is my last Modern Reject post after all. This last year of blogging has left me wanting. I found myself less and less dedicated to this blog, less and less motivated, and less willing to write the kind of posts I had become known for writing. I didn’t want to drum up controversy, or rock the boat, or stir the pot anymore. Basically, I didn’t want to be the Modern Reject anymore and for good reason. Because I’m no longer the Modern Reject. I am not the same person I was three years ago when I started this blog. Praise Jesus. Can I get an “Amen!”? So much has happened in that time that has changed me and shaped me, making it virtually impossible for me to go on doing business as usual. For one thing, I had a third child, my darling adventurer, Beckett. I thought a baby would be nothing more than a bump in the blogging road, but instead he brought me to a complete halt for months while I nursed, and cuddled, and stared at him whilst also wrangling my other two children. Then, my physical pain reached an all-time high last year, leaving me in a daze on good days and bed-ridden on the bad days. I couldn’t even think of writing. It was the last thing I wanted to do. Instead, I wanted to curl up in a ball and try not to feel. God’s grace and mercy has been made known to me this last year in tremendous ways, but the pain remains and it has slowed me down and made me reconsider much of what I do and why. Also, Jonathan and I planted the organic church we are so amazingly blessed to be a part of. Nothing could have prepared me for the amount of radical change, freedom, and transformation I would encounter in, among, and through this body of believers. Members of my church family have said that my whole demeanor, countenance, and interactions with them are different from 2 years ago. Jesus does that. He makes us more like Him…and I’m grateful. But that also means, I’m different and what once made my heart go boom no longer does. What once felt significant and worthwhile slowly began to feel fruitless and unnecessary. Truth be told, I also became a bit jaded and disengaged with the “Christian blogosphere” where the painful practices of cliques, cool kids, uniformity over unity, and theological masturbation which are present in many traditional churches are also the norm here. If your eyes glazed over from seeing such a long passage of scripture, I apologize. I had to do it. This passage was a revelation to me. I’m tired of reading and watching Christians judge, condemn, and berate other Christians. I’m tired of watching believers elevate their own self-made religion and regulations “and not holding fast to the Head, from whom the whole body…grows with a growth that is from God.” I’m just tired. That’s not to say there aren’t a whole lots of bloggers whom I respect and admire, because there are. Overall, however, after 3 years of Christian blogging, I feel ready to say “goodbye” to the whole thing. More importantly, I finally feel like the Lord is allowing me to say “goodbye” with no shame and no regrets. Of course, this isn’t the way I wish I was going out. I wish I was saying sionara Breaking Bad style–you know, all on top of my game and keeping it tight with high drama and brilliant writing. But I’m not. I’ve slowly neglected this blog and I’m saying goodbye on a low note. I’ll admit that a few weeks ago, I started crying and cussing in frustration for having let Modern Reject dwindle away. I felt like a failure, who’d accomplished nothing. But I also know that none of this–NONE OF IT–would have been possible without you. You, my wonderful readers, are one of the main reasons this little blog kept churning. Your comments, social media shares, emails or encouragement, prayers, support, and general awesomeness have spurred me on time and time again. You rock more than you will ever know. And I love you. So, thank you. Thank you for sticking with me and not giving up on me. Thank you for believing in me and this blog and continuing to encourage me to keep at it. Thank you, thank you, thank you. I owe so many of the words I have written to you. Of course, I wouldn’t be me if I didn’t have something else up my sleeve. Long ago, right before I started Modern Reject, I had an idea and it was one of those big ideas–one of those God-given ideas. You know the kind that could potentially change your life? I had one of those ideas. But at the time, I didn’t feel equipped or capable of pursuing it. I knew I had to choose between the “big idea” and Modern Reject. I chose the later obviously. But, wouldn’t you know, this blog has helped prepare me for the next thing far beyond what I could have imagined. I can’t give away too many details (forgive me for my secrecy), but in the next few months I’ll be launching a whole new project that will be radically different from this here blog. If you’d like to stay in touch with me in the interim, I’d love for you to do so. You can add your email to my email list (just type your email into the box at the top of the page) and be among the first to know about what I’m doing and what’s coming. Until then, can I ask for you to pray for me? I covet your prayers. Would you please pray for my health and my pain, for God to increase my vision and my faith for the new project He is leading me into, and for favor among God and men? I would be so grateful and blessed. Also, please know that all of my Modern Reject posts will be archived and this site will remain up. You can come here and read or re-read anytime. It’ll feel just like the good ol’ days. Promise. And so, this is goodbye. Its been real. Its been fun. I’ve had the time of my life. Truly. I’ll miss you all terribly and hope to stay connected. Thank you for everything–every single bit of it. You’re my favorite. I’m so glad I know you. Been enjoying Modern Reject for a long time. But I reached your conclusion years ago as well regarding Christians shredding Christians. You always have thought-provoking stuff. I’ll look forward to your next career iteration. I’m sorry to hear this, Nicole, I’ll miss your blog. But I’m happy for you and for the next step. It sounds like you need this. I look forward to seeing what you move forward into. Thank you Nicole. I’m fairly new to your blogging but I have greatly appreciated it’s content. Best wishes and blessings for your next chapter. It takes courage to know when to step up to the plate and do something. Personally, I think it takes a lot more courage to know when to step down. That said, I wish you better health, great mothering, and the time and peace to hear from God “what’s next.” God bless! You gotta do what you gotta do! No shame at all in that. I look forward to hear your announcement! Nicole, as I read this post I had so many mixed feelings. Selfishly, I will miss all your openness,boldness, frankness and all the other nesses you often shared. You have been encouraging, educational, humorous, and controversial at times. But I always saw Christ in you, thank you. I look forward to hearing of the things that you move on to, and how the body of believers you meet with are doing in future months and years. I so relate to your frustrations with our current, hopefully “western” dissecting of Christ body that goes on, seemingly from all sides, it is truly pathetic. (I say hopefully “western” because, I hope that in countries that there is a real cost of following Christ, that those who do, have a unity that does not appear in the western world). You are an inspiration, thank you again. Continue following after Him, may He bless you, your marriage, family and the body of believers you meet with. I will pray for you, and your health. TTFN. John Morris. I’ve enjoyed your thoughts. Thank you for sharing them. Gurrrrrrl. Exactly. I’ve barely blogged this past year. For the same reasons.I think droves of bloggers are feeling the same way. It’s interesting that you posted this today which corresponded to my daily bible reading in Ecclesiates. “There is a season for every purpose….” The ending of a season is always hard but it sounds like you (and us along with you) are on to a new thing! I can’t wait to find out what it is. I, myself, am experiencing a new season. We’re moving half way across the country at the end of the month. Away from our home for the past ten years, all my dear friends, one of my college age chicks and a life I love. But I think the Lord is getting ready to do a new thing in me so I’m trying not to cling too tightly to the “past”. I’ll be praying for you….appreciate your prayers too. While I’m VERY sorry to not be able to read your posts anymore, I understand your reasons. Completely. I only wish I’d posted such an eloquent goodbye on my blog before I stopped writing! Never too late, I guess. But I pray your future endeavors will be successful and will bring glory to God in ways you never imagined! Nicole, I have read every post of your blog. It is a gem as you are. Your growth is evident and God has worked through you in amazing ways-reaching people who didnt even see it coming. Excited for what He has for you in the near future! I truly feel happy for and proud of you, and I champion you on in your next endeavors. I’m thankful to be working alongside you in ministry–in large part because of your candor and integrity. May The Lord give you increased sensitivity and grace, in Jesus’ name. Much love, Nicole. So much love. I have really enjoyed reading your perspective. As a RFR (Recovering From Religion), I crave the ability to surround myself with intelligent, passionate and loving individuals like yourself who believe strongly in your personal relationship with God. Thank you in your journey. You have helped bless my life. “Little blog”? I think not. The blogosphere was better for your voice being a part of it, Nicole. Your absence will make a difference, but if the Lord is really leading you elsewhere, He knows best – and I greatly look forward to seeing what comes next in your life when you’re ready to share it. Sounds like the blog accomplished what it needed to in more ways than one…and you are ready to move on. Good for you! Thank you for being faithful and answering that original call. Through your blog, I have experienced the sacred in the ordinary. God has used your words to encourage, inspire, and challenge me. Thank you for being faithful to your Heavenly Father’s call. He has begun an awesome work through you, and he will complete it. Thanks for always pointing us to Jesus. I have come very recently to you and your work. I love(d) the passion with which you wrote it: your faith is obvious and seems strong. So may God multiply His blessings for you as you go forward into … whatever He calls you to. Thanks, Nicole. I’ve enjoyed what you’ve had to say. One of the problems that, I believe, the “church” in general has – and perhaps just being human in general – we follow a good God idea, but don’t realize that He is always the Master Creator and Author. Therefore, His books have chapters. His “manna” has an expiration date. However, not realizing that fully, we try to keep re-doing the same chapter and drag the original good God idea past it’s grace period. I’m going to keep my email subscription in tact and look forward to your next good God chapter. Bravo, Nicole!!!!! I am so deeply proud of you, impressed by you and spurred on by you!! You are courageous and adventurous, and you have learned how to do that while being an awesome wife and superb mom!!! God has blessed this work and I pray that the next work is doubly blessed!! Can’t wait to hear. This was a classy end, an appropriate way to bring down the curtain, and now you are free to go headlong into the next season. I will be cheering you on!! Thank you Tracy. That means a lot. ha ha! Thank you Chad. Hey, if Modern Reject ever accomplished anything, it helped bring you and Tricia, Belle, and John to our church family. That alone was worth it. Bravo, I say again bravo! You are just like the caterpillar experiencing the metamorphosis of Life ‘in’ Christ. Few things exclaim that point more than the desire to move forward, and to be centered ‘in’ Christ. I’m thankful for this site, for in and through this I have come to ‘see’ a very beautiful saint, and her beautiful hear, thank you Nicole. My prayers are with you and your family, and the future, the glorious, magnificent, and creative future we have ‘in’ Christ and His Kingdom. I fell upon your blog. A while ago, and enjoyed it very much, and like others have said already, it was challenging and made me feel abit uncomfortable at times, I wondered if u would loose your faith in Christ,or might turn others away from Christ…….sometimes I feel like I have to fight for Christ,but realize HE does not need MY help, I sorry you have such pain, love that you had another baby….. You see through your pain,it has matured you? Seeing Christ more clearly,and being done with this critical part of Christians and THIER issues!!!!!! we all see the human part of Christians and THIER eager ways…… But then THIER is just CHRIST………….. And here we will be one day ……..wondering HOW we did!!! I look forward to your new posts, REST!!!!!! Thank you sweet friend. I have been blessed by your support and encouragement of this blog. Thank you for your prayers, as well. Your blog reminds me of the old Cornerstone Magazines (from its newsprint days to its magazine days) that I used to run to for something that sounded more like what I was experiencing and thinking and longing for in my own walk with God. I think most of your readers feel exactly the same as what you’ve expressed here. I’m sure there is a time and place to pick some things apart and drive points into the ground. I’ve never enjoyed learning quite that way. I have enjoyed the challenges you’ve put forth on your blog and will look forward to your next endeavor. Meanwhile, we’ll all be praying for you and your next turns in life. Especially for your ability to either be healed or know how to keep on keeping on in spite of your health. God has used you to make sure we don’t forget about how we are all sinners, not just the people who end up on the 6pm news. All of us. And yet, He still uses us like crazy!! He must really love us, more than we can understand! You have made me think hard and dig deep with many of your posts. I confess I didn’t always come to the same conclusions as you, but wasn’t that the point all along? For you to help me stretch and see what God and not Nicole had to say to me? Thank you for being an authentic voice who follows her God full force. I can’t wait to see what He does with you next. Nicole, even though the quantity if your writing has decreased in the last year, the quality hasn’t. I have so appreciated your perspective even if I don’t always comment or even if I don’t always agree/understand. No one Christian understands God or His Word completely, at least in this life, and you have always given me a view of God from a slightly different perspective. Continue to fix your eyes on Jesus and all the blessings he has given you. Dear God, please give Nicole complete peace during this time of rest. Restore her strength and health. Bless her time with her kids and husband and church family and help her see the fruit that comes from rest as well as the promise of fruit when You again call her to Your work for her outside of her family. In jesus name, I pray. I’m excited for you, Nicole. Congrats on all you’ve done and all you will do. Lot’s of love to you, girl. It’s sad to see you go, but I understand. We love and appreciate you… and wish you all the best in your future endeavors. Hi Nicole, this will be my first…and last post on your blog. I believe it is fitting to write this, considering that it was YOUR blog that served as the catalyst for my entry into the wonderful family of believers that gather together at yours and Jonathan’s home. This body of believers, of which I am a toe nail (on the smallest toe!) reflects the essence of your blog and the character of your witness. I was telling Jonathan and Juice (Super bros Inc.) of the church that meets at your house, and of which I am honored to be a part of, is the most authentic, loving, wise, and precious I have ever experienced. You and your blog Modern Reject reflect the same authenticity, love, and wisdom. These precious traits made me desperately reach out to Jonathan and Yourself to help me quench the thirst I had for over 24 years; the thirst for authentic fellowship. So, if you ever doubt that Your blog did not accomplish what You imagined or that it did not serve our King’s glory, THINK AGAIN! I am a living testimony of it and I am so grateful to you and to our Lord for setting it before me. I could go on forever giving You praise through our Lord Jesus Christ but I will end with this last declaration from the heart, and I would be confident each member of our family would agree with this; that You are a pillar of our church, solid and indestructible in the Lord; that You are an inspiration not only to the women of our family but also for the men, and especially to me. You bring great glory to our Lord and King! It has been such an honor to know you. I love you deeply in the Lord. It’s a beautiful thing to recognize the season we’re in with our life in Christ. Your season as a blogger has been rich and fruitful in my life. Thanks for always expressing what is real in you. Although I will miss your posts, I will be looking forward with anticipation along side of you for the next season. I feel you, and is part of the reason I didn’t want to make my blog a “Christian” blog – but more about our homeschool and family. I’ve evolved over the past few years, but it feels like my readers have evolved and changed with me and that is good. I’ll miss your insights and you straight-forwardness. But yes, it is a good thing to know you are ready to move on. I think it’s a wise woman who listens to her heart and to God on knowing when to step away from something, despite the pain that may bring. But I do believe there is a continued need for writers to share their heart through the blogging platform, and pray that others will continue to step up. I get it. I truly, truly do. After Thing Two graced us with his presence last June, my blogging kinda…died, and I’ve been questioning the if/why of starting back. Like the wise Jessica said, there are a lot – A LOT – of us who are feeling the same thing. I makes me wonder if it’s not a God thing. Still, I count meeting you & your husband in person as one of the TOP moments I got from reading your blog. Your words have mattered more than you imagine. And doggone it, you’re going to be missed. You will missed here! You have written a lot of things that have made me think and other things that were entertaning but with substance. And I have to admit sometimes it was hard to read, because it was convicting and meant to be so. Ah, the Christian blogosphere can be so competitive and it shouldn’t be so. bleh! I’m so glad that we will still be able to read your posts though. My husband still has one of your posts (at least part of it) plastered on his wall :) I can’t wait to hear/read what’s coming up next! In some ways, writing “The End” is a triumphant moment. Sort of Eric-Liddell-crossing-the-finish-line dramatics. Then there are those stories where “The End” is a huge relief to write, because you wanted to be done 2000 words ago, but there was a little more that had to be said. 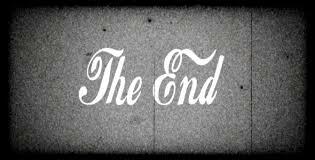 I think, regardless of the circumstance, “The End” is a satisfying point to reach for every author. Just because this is a blog does not make you less of an author, or the finality of “The End” any less worthy for you. Even the best books must end; even the best stories have their climax and final resolutions; even the best blogs reach the end of their time. This has been one of the best, and I’ve been so privileged to read your thoughts and often share your opinions. I’m pleased you’ve chosen to keep the archives open; you’ve got some good stuff in there. And I look forward to seeing what God has next for you! Thanks Nicole for the ministry that you have had with Modern Reject. Your posts were a blessing from God with the issues you raised that other parts of the church wouldn’t and the thoughts and dialogue that they brought forth. I believe the Kingdom of God is richer and stronger for them. May God bless you in your new project which I’m sure in turn will be a blessing for others and the Kingdom. What we always think is everything, is only preparation for everything. Our “all things new” King has more for us than we could ask or imagine. Good story demands change that carries mystery, drama, comedy, horror, action and adventure. Thank you for sharing some of your story along the way, insights and things you find interesting. It was a great ride. May God reeediculously bless you, your family and your future endeavors. I just want to say thank you. It was through your posts that I learned I was not alone in how I felt about the change in church and Christians. I needed to know that then. My prayers and blessings are with you. I found Modern Reject just recently and I’m still reading through many of the posts (I actually would rather not read the comments for reasons stated above). Everything I have read from you has pointed me towards Christ. Everything I wasn’t sure I understood or agreed with pointed me towards His Word. Thank you for writing and for sharing what God has put on your heart! Thank you for letting Him use you (and I know He will continue to do so). Blessings to you and your family! Think of it like the Israelites between the exodus and Joshua 1. The short form: when God said “move,” they moved. When God said “stay,” they stayed. Even after the 10 whiners hosed things up, they continued doing just that. Likewise, when God says “go for it,” go for it. When God says it’s time to change priorities, change those suckers. It’s not a “break from God,” as the title of another post said, but rather it’s truly following God’s will for you, not what we determine and conclude is God’s will. My blog has been free of new posts for “too long,” by blog standards, but God hasn’t told me to take it down yet. He has called me to do something a little more generic, like Chad Jones’ blog or this one, but exhaustion from the stresses of life have kept me from giving it full attention (which is, I suspect, part of the reason He wants me to be a bit more generic). As for being on the defensive, welcome to Earth. We children of God & joint heirs with Christ are in enemy territory. Your battles will just be different now, that’s all. God does bless u n will continue too. Enjoyed ur thoughts while learning at same time. Spread ur wings “Butterfly” and live your New Life. I have appreciated your wrestlings, ponderings, and thoughts here over the years. Thanks for your honesty. It seems like, even though your direction and viewpoints have altered on some things, that your gifts and passions for study and writing are still there. I’m curious to see what your new project is, and hope that you still choose to use your gifts and passions for your loving Abba God. :) He planted those in you. I only discovered your blog today and am sad to see that it will not continue. However I am thrilled that you have decided to follow a new path towards something bigger and better for you and your family. I do hope that you remain well, get your well deserved naps, that your health improves and that your pain ceases. Good bye and God bless you and yours. fats are almost exclusively found in processed foods. Unfortunately this, your last post, is the first one I’ve read. I think I linked to it from Flixster- through a review for Do a You Believe? You were writing about why Christian films are of such poor quality. Timely because just last night I *tried* to watch Killing Jesus on NatGeo channel. Another disappointment, as it portrayed an affable Jesus stripped of his authority and power- at least in the first 45 minutes before I gave up. Anyway, I’d be interested in hearing about your new project. Nicole. I must admit that after I read your article, 5 Lies Christians Believe, on Church Leaders.com, oh, about 15 minutes ago, I had not heard of you. That is my loss, and right now am feeling quite disappointed that I walked into the play only to hear the last line. I was “happy” to read something from a kindred spirit. Thanks! I will be reading previous posts. Well, it looks like I found you about a year too late, actually longer from the start. I have gone back and read some of your writings and responses, what I enjoyed was how so many people interacted without becoming offensive…or maybe you deleted them…fine with me. I’llbe back to look over your archives. Going to look for your current stuff now. My wife asked about your blog, and I thought I’d give it a look after many years. As you know, I came to a similar conclusion myself about blogging, and it’s been quite a while now since I wrote under The Minor Prophet. Im an Orthodox Christian now, with a 2 year old daughter, and living in Canada. Send me an email if you’d like to say “hi” sometime. I wish you all the best, and I’ll add you to my prayers. Came across this from a link, that led to a link, that led…….Anyway, hope and pray that it has all worked out for you and yours. Beckett must have his wheels on right about now. :-) Enjoy the chasing. Would have enjoyed breaking bread and sharpening iron with you. Eternity is a long time….enough time to know Him and thereby each other. I’ve just discovered your website and your final post. I can tell from the way you write and the things you say that there was a lot of good content coming on here. The way you discovered organic church and how it is being liberating and alive to you and your fellow believers is also very exciting. I assume this, and the closer mutual edifications that comes from it, also had a lot do to with the transformations you experienced from God in the last years. I am looking forward to your new project, will subscribe and include you in my prayers. thatt may be very addictive! I’ve just come upon your blog, 2018! I just binged on all your posts, finding it particularly fascinating that your posts from 2012 are still so very relevant in my own life today (and others as well, I’m sure!). Which leads me to believe that your blog was truly led by the holy spirit, because his voice will always be relevant, whether it be a thousand years ago or merely 6 years ago. I appreciate all this blog has contributed to my own personal life now and appreciate that people like myself will still be able to stumble upon it.